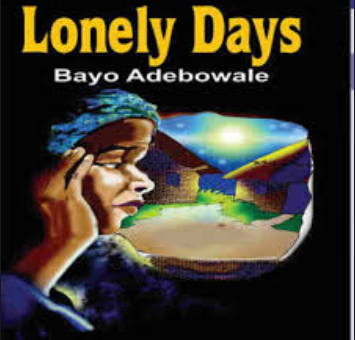 Lonely Days a novel by Bayo Adebowale, centers on the African culture where the female folks are made to suffer for the death of their husbands. The novel also brings to time light the treatment melted out to widows,this is exemplified in the character of Yaremi, the major character in the novel and other characters such as Dedewe,Fayoyin and Radewe..
Bayo Adebowale(born 6 June 1944) is a Nigerian poet, prolific writer, novelist, critic, librarian and founder of the African Heritage Library and Cultural Centre, Adeyipo, Ibadan Oyo State. He has published hundreds of books, short stories and novels as a prolific writer. His debut novel, The Virgin, was adapted into two Nigerian films: The Narrow Path, a 2006 Nigerian film produced and directed by Tunde Kelani, which starred Sola Asedeko, and The White Handkerchief.He authored Lonely Days, a book that focuses on African culture. Chapter one: Yaremi is a widow, her husband Ajumobi died nine months ago. Thus lonely days sets in for Yaremi, especially as her two daughters Segi and Wura lives far away.Her son Alani also lives in Ibadan, but her loneliness reduces when her grandson Woye comes to live with her. Woye assists her in her works, especially in selling her taffeta at Sagbe Market three miles from their village, Kuffi. Chapter two:Yaremi learns to cushion the effects of her situation in life with the hard work on the farmland. Yaremi is portrayed as a woman of hard work. She works exhaustively both on the farm and in the kitchen. She remembers Ajumobi and how he assists her when he was alive. Chapter three: Dedewe, Fayoyin and Radake meet at the narrow road at Kuffi(the widows' road)They narrate their stories of maltreatment during widowhood. Fayoyin narrates her experience of how she had been given libation to drink when her husband died and how her hair had been cut. Chapter four: Yaremi continues to work hard but during leisure times, she engages Woye in happy reminiscence of her childhood. Chapter five:The people of Kuffi are suspicious people. They suspect Yaremi be killed her husband.The chapter reveals the people’s superstitious beliefs. Chapter eight: Woye is sick,and Yaremi knows if he dies the villagers will accuse her of witchcraft. So she does everything in her power to make him hale and healthy, Woye recovers at last. Chapter nine: The women of Kuffi are dependent women, they depend on their husbands. A good number of them envy Yaremi for her liberty and freedom as she gradually manoveurs her way into a position of reckoning in the village. But this development does not go down well with the men of Kuffi. Chapter Eleven: It is cap picking ceremony and according to tradition,a widow is supposed to pick a cap among her suitors cap. Yaremi is expected to pick a cap. She goes round the caps belonging to Ayanwale,Olonade and lanwa. But instead of picking a cap,she walks out on the elders and the crowd. Chapter twelve: Yaremi's popularity and respect weans because of her rigidity at the cap picking ceremony. Chapter thirteen: Segi comes home to Kufi. She is Yaremi first child. She breaches into Kuffi to giver her unflinching support and cooperation to her mother. To her ,a second marriage isn't necessary. Woye follows her mother, Segi backs to Olode and Yaremi becomes lonely again. The novelist uses the third person narrative. In the third person narrative,the narrator is outside the story and he refers to all the characters proper by their names or he" "she" and "they"
In this statement,Yaremi predicts what is going to happen. 2. Suspense: This is well used in the novel, an instance can be seen in p.g 114-116, where Yaremi is supposed to pick acap. In going round the cap ,the novelist had managed to create suspense in the readers' mind. 3.Flashback: Through flashback ,the novelist brings to our remembrance how Yaremi and Ajumobi were living before his death. An instance of flashback can be seen in p.g49. 4.Symbolism: Bayo Adebowale uses the character of Yaremi to symbolize a strong African woman who will not give in to oppression easily. The novelist also uses the character of Dedewe, Fayoyin and Radeke to symbolize African women who are weak and who give in easily to oppression. Segi: She is Yaremi's first daughter and also the mother of Woye. He is eager to learn. These are three other widows in Kufi. Their experiences reflect the injustice and ill-treatment meted out to widows by members of the society. These are Yaremi’s suitors. She turnes down their marriage proposals when each of them approached her privately. She further rejectes them all in public during the cap picking ceremony. 1.Theme of loneliness and widowhood: In the novel, widowhood is associated with loneliness. This is because widows usually don't have anyone to comfort them after their husband's death. This can be seen in the character of Yaremi,she became lonely the moment her husband died. 2.Theme of hostility, maltreatment and suffering: The people of Kufi are hostile to widows. They treat widows anyhow and maltreat them. 3.Male chauvinism: This is a belief or notion usually held by men that women are inferior to them. Yaremi suffered resentment from most men in Kufi because of her self-reliant and assertive status. 4.Death: In Kufi, the people believed that there were good and bad deaths. Yaremi consoled herself with the notion that Ajumobi died a good death. It was also believed that the dead people watch over the living. This explains Yaremi’s many monologues addressed to her late husband, Ajumobi. Since the novel has a traditional setting in the form of Kufi village as one of its setting,there is the use of folktales which is primarily for entertainment. An instance can be seen in p.g61-62 where Yaremi told Woye a folktale concerning the moon. Folksong is also see in in p.g15 where Yaremi sang a song saying that she is like a fire that needs to be tamed.